A rail fastening system in slab tracks must be perfectly sealed – in order to prevent stray current and to reduce the vibration in the track and thus also the noise loading of the train traffic. 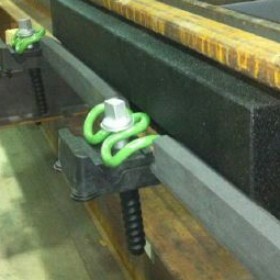 Vossloh´s chamber filling elements were specially developed for insulation of slab tracks in urban traffic. They are inserted into turnouts, soft concrete or grass and seal the rail electrically and acoustically.